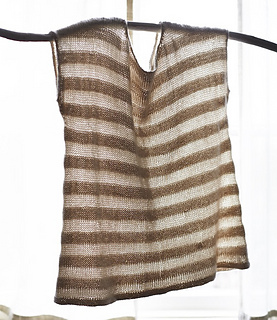 It’s a striped fabric made from exactly one yarn. The subtlety and cleverness of this is something we really love. Using two strands of Jade Sapphire Sylph, we make the stripes first with one strand, then two strands carried together. The shape is as elemental as imaginable—it is worked from the bottom up, in the round, until dividing to work the top part back and forth. There is plenty of ease in this pullover, and drape. 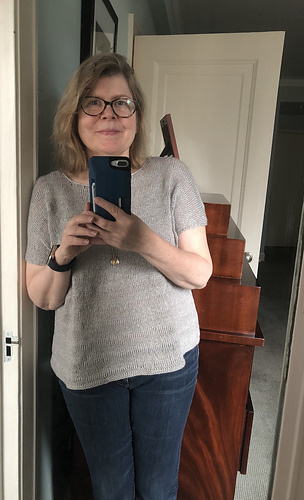 For Kay’s notes on knitting her Shakerag Top, including fit and finishing, see her post on MDK here. Sizes S, M, L (finished bust measurements 39″, 44″, 48″): 4 skeins. Sizes XL, 2XL (53″, 57½”): 5 skeins. Size 3XL (62½”): 6 skeins.